Yes, Black is used for jinxing and crossing work and the wish candle is used for wishes. Remember all wishes are not positive. I would back this up with an appropriate figurine candle representing the individual...or a vigil candle. Looking for advice on what LM products (herbs, incense, etc.) to use for making a wish. Attraction products along with a Lodestone and the Job's Tears. Write your wish on each knob. Dress it with Attraction Oil. Write our your petition and place it under the Lodestone. Light your candle and feed your Lodestone while asking that it bring what you desire. Carry the Job's Tears for 7 days while you work the spell over those day. On the last day, bury the wax in your front of your house and toss your the Job's Tears in the river while praying. Please read all of the previous posts in this thread and also this link from my free online book "Hoodoo in Theory and Practice. 1. should i carve my wish one knob each day before lighting or re-lighting it? i have read on this thread that it could be quite messy working with 7 knob candles and i am afraid the rest of the knobs will be covered with wax as i will be working through. 2. should i dress one knob each day before lighting or re-lighting it? I have been burning the green seven knobs candle for five day. It is a specific spell advised by Miss Cat during my reading. Everything was going good the candle light was high and stable. I had six jobs interviews in two weeks. I am supposed to have some news next week and today, on day six, when I went to pinch the candle light after the six knob had burned I saw that the light went off by itself. I think you should forge ahead -- relight that last knob on the 7-knob candle -- and get a reading on the sign you saw in the Road Opener candle flame. The clubs in playing cards are equivalent to the Wands in Tarot -- the suit of the go-getter, of persistence and courage. You might want to do some more work with Power and Crucible of Courage products in addition to the other things you have been using. You might also want to do some protection work in case you have awakened someone's jealousy (someone else interviewing for the same jobs, perhaps?). First, though, you might want to check with a reputable reader; the "clubs" sign suggests to me that a card reading would help you. As soon as I relight the candle, the wick went down and went off in the pool of wax. Even thought part of the seven knob did not melt, it looks like the candle just burned out. It looks very creepy! Definitely need a reading! Meanwhile, I am repeating the spell. I am burning my 7-knob wish candle to get a job. I am repeating the spell since there were problems with the first candle (light went off). The candle is burning much better after I put a cayenne pepper for protections around my candles. However the wax from the candle spilled and covered almost all 14 coins that I put around it and the business cards under the candle. Long story short- everything is stuck in candle wax. I am supposed to donate the coins. How can I pull them out without breaking the wax? May be I'd better keep them in the wax and bury with the candle remains? Today is the last day of the spell and the candle wick formed in a very obvious and clear orchid. It is the second time during the spell the wick formed into orchid! Any ideas what it means? Any advice is really appreciated! What should I do with the candle remains if I can't bury it in front of the business that I am applying with? Please advise! Thank you so much! kaghazade wrote: the wax from the candle spilled and covered almost all 14 coins that I put around it and the business cards under the candle. Long story short- everything is stuck in candle wax. I am supposed to donate the coins. How can I pull them out without breaking the wax? May be I'd better keep them in the wax and bury with the candle remains? First read the wax for any signs of success or failure. You might even want to ask your reader if s/he reads signs in candle wax; if so, take pictures for him or her to look at and schedule a brief reading. Then just break the wax right out of the coins. Once the candle is burned and the signs are read, the wax has served its purpose. You may need to make a small packet with just some of the candle wax in it, small enough to inobtrusively tuck into a flower bed or even under a plant in one of those flower beds (seems like almost all businesses have plantings around them these days). If there are NO plantings around the business, hide it on the property. The candle wick formed in a very obvious and clear orchid. It is the second time during the spell the wick formed into orchid! Any ideas what it means? Thank you so much for all your help, MissMichaele! I bought a large green pyramid-shaped candle with an eye for drawing money, it said to use with money drawing oil and magnetic sand, so I got those too. Since I've used 7-knob candles before. (white few wishing and black for cursing and uncrossing. I bought a 7-knob green cable too. But I don't know how to use 7-knob green candles. Do you know what I do with the 7-knob green candle? Other money drawing supplies I have are: magnetic sand, money drawing oil. Fast luck oil, and pyrite gravel. I'd really appreciate the advice on how to use the seven knob green candle. Last edited by catherineyronwode on Fri Jun 14, 2013 8:35 am, edited 2 times in total. Reason: Merge two post of the same question to be one. Adjusted spelling for easier reading. Hi Caligula, I went ahead and merge your posts into an ongoing discussion on the use of 7-Knob Candles. I also merged your two posts, found in two different categories, with the same question. Per the Lucky Mojo Forum Rules, please do not make multiple posts on the same question. It helps to minimize clutter, and keep the forum clean. 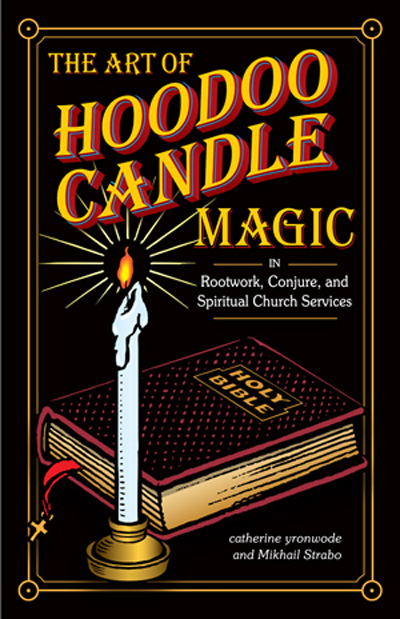 Another great resource would be Miss Cat's new book, The Art of Hoodoo Candle Magic. I have been following the recommendations of my reader and the results have been just as she predicted and very good. Last week on Friday morning did a reading for myself, the first in a long while. They confirmed the good things I'd been seeing from my work: 2 of cups, The Sun, and 9 of cups. That night I had a strong feeling when I lit my honey jar candle that I should start a white 7-knob candle. I happened to have one (be prepared!). I prayed over the oils to use, the plan, what the petition and progression would be. The candle finished last night, and I burned it along with a lodestone moving spell (does anyone else find lodestones adorable? They have personalities, I swear). I work with Ganesha and I did puja for him daily and asked him to bless and watch over the work. First two nights were for open roads. Second night the flame grew black and high after lighting and then cooled down and bam! the side of the knob opened and a gush of white wax poured through forming a puddle that made very definite shapes at the base of the candle. For every night I burned, there were huge signs and movement the next day, professionally and personally for both people involved. Leaps actually. So the candle was a mess by the seventh day and the lodestones finally got to link up their hairy little hands, but the results were worth the spills, which made all sorts of clear shapes, transient and permanent. The last night's knob left a bit of rim standing but folded out, the wax in swirls around. I do not get any negative feeling from it, but it could be a sign of something being left undone. Now, to say thank you and keep the work's energy flowing, do I just use the same ritual disposal as with any other candle or keep part of the wax with the lodestones? Also, to say thank you to Ganesha and ask for continued favor, what is appropriate? Thank you all for your recommendation to try the 7-knob despite the mess. It's been a great experience!! Your description of the burning of the 7-knob candle was quite eloquent. Thanks. Lodestones do ideed have personalities. That is why we name them, feed them, and think of them as "alive." I want to order the 7 knob candle in white for general purpose. My question is it is okay to make 4 wishes on each knob for love and 3 wishes for success? Or should I burn 2 separate candles? So, you can do (and this is just an example --->): love, love, love, love, success, success, success. Oh yes that's what I want to ask, 4 love wishes in 4 knobs then 3 success wishes on 3 knobs in one white 7 knob candle. My mistake sorry and thanks for a quick response! My next question is should I carve my wishes from the bottom or from the top? I've watched madam Pamita's 7knob candle video and she said carve the wishes from the bottom to the top. My wish lists are 4 love wishes comes first then 3 success wishes follows. So should I carved my wishes starting from success because I'm going to light the candle and I wish to grand my love wishes first or it doesn't matter which comes first? Yes, you have it right: bottom to top (that's how I would do it). And then the success toward the top. That way, you have success first and then perhaps additionally not just love BUT success in love. That's the way I would look at this. Every root worker is different. This is just how I would do it. Wishing you SUCESS and lots of LOVE! I'm starting a 7 day knob candle today and using 3 different herbs and oils on it. My question is, after I inscribe and oil the candle, I rolled it in the herbs and for the LIFE OF ME, I cannot get the herbs to stick in a sufficient amount when doing so. Would it acceptable to sprinkle the herbs on top of each knob each day while restating my intention and praying before lighting? Thanks! Yes, that is a little tough (unless you grind them). But, of course you can sprinkle them each day over the knobs. I need some advice. I have been burning a red 7knob candle on top of my honey jar for four days now to bring a lover back to me. I have followed instructions to the last detail. Every night i annoint it with Reconciliation oil, Love Me oil, Come to Me oil, and Look Me Over, and i sit next tp the candle and ask my spirit guided and angels to come forth and help me with my petition. Then i kind of state my intent over and over and try my best to focus on the flame. I know this works on energy and how much i put into it, but since its a consecutive 7 day thing, i cant take a break. Last night i was just depleated of energy from my hectic day. I tried my best to focus and give my energy to praying my intent but i couldnt focus and it just felt like reciting words without thought. Has this ruined the spell? It sounds petty but i want this so much, i dont want to mess it up. I think you'll be alright. Thank you for the words of reassurance miss Aida. I am on my last knob and am getting absolutely nothing not even a sign. I am feeling very discouraged thusfar but still hopeful that things will take a better turn soon.. I would recommend trying not to worry to much. Not every working comes with signs that something is happening. Sometimes things just come together all at once! I should give a positive update because i love reading about succesful work on here. Now, as i mentioned i have a honey jar i worked with the 7 knob candle for bringing back a love.I am also working with Love Me oil, Reconciliation Oil, and laying tricks with Love Me sachet powder. At first i saw no signs. We were barely on speaking terms and its been months. I really was thinking this was a lost cause. But Out of the blue things have done a 180. He is looking for me, coming to me, and pretty much telling me he will do anything to keep me in his life. I saw him yesterday and the way he looked at me, i am certain there is love again. I dont know which of the angles i am working is the one producing results, but i have a strong feeling it was the 7knob candle that gave this the push it needed. So I was using a 7 knob candle to reconcile with my ex but it burned out before the 7 day what should I do? What you should do is learn how to use a 7-Knob candle according to traditional methods. The candle has 7 knobs. Each day you light one knob and let it burn. When it is finished, you snuff the candle or pinch the flame out. You do not blow it out. You do not cut the wick. The next day you light the second knob and extinguish the candle when that knob is finished. The third day you light the third knob and extinguish it when it is finished. You do this for seven days. Thank you catherineyronwode, it was my fault and it burned out, I was dealing with roommates drama and I lost track of time. I will be buying the book soon. What color 7 knob candle do you recommend for attracting customers to an online store for art? Also, if I do not have customers coming into my physical home, do I really need to mark & anoint dollar bills? Most of my business is through credit & debit. Also, would it hurt to mark and anoint the money? No! Of course not! You can also mark and anoint a makeshift credit card saying something like: "All Customers" (as the owner). 7 knobbed green candle question. My partner had a dollar bound with Mandrake root in his wallet and lost it. I have mine still. We made them around the same time at the beginning of the year. He wants to get a 7 knobbed green candle and write on each knob Mandrake root dollar please help me with money and put it out each day for 7 days. Beforehand, he wants to make the new Mandrake root dollar. He also wants to anoint it with fast luck oil. (The candle). Then,when done, throw remains at crossroads with a prayer. Is this a good idea?? I think it sounds like a great idea! Wishing you wealth and success. CAN one write the intention/wish 7 times or must it be 7 different ones? Again I am VERY new! That's up to you, really. If you want to emphasize your wish so much that you're burning a candle knob for it once a day for seven days, go for it! I am waiting for my break up supplies such as the powders, oils, and so forth and should receive them hopefully in a weeks time. 1) I am using the 7 knob candle spell in the book "Destroying Relationships" and wondered is this the best one to start with ? 2) Should I follow up with the break up kit? Because, I want to try a few others spells from the book. 3) Should I just wait till I complete the 7 knob candle or try several spells at once ? 4) I am also considering seeking a professional spellcaster's help too since i’ve never done this before and hope it works. 5) Also, how long does it take to work after it’s complete ? WHICH MAGICK SPELLS ARE THE STRONGEST OR MOST EFFECTIVE? 2) You can try the Break Up kit or any of the other spells in the book while you burn your 7-Knob Candle. IF I CAST TOO MANY SPELLS WILL I GET "SPELL OVERLOAD"? Thank you for your reply. The articles you sent me were very helpful. I have instructions in my book on how to use the 7-knob candle and I have read some advice on the forum, but I find there is not a lot of detail in the book on anointing the 7 knob candle. Is there an article solely on how to use the 7-knob candle for break up work? I want to make sure I am doing it right. Also, is there an article on fire safety? Because, placing oil on a candle and then lighting it sounds counterintuitive. Lastly, I have read on the forums that one knob can take 2-3 hours to burn so when setting an intention does it only need to be done for 15 minutes and then let it burn? What prayer should be said for a break up? Should I just focus on the couple breaking up for 15 minutes and say a prayer ? I just really want this spell to work. I know there is no guarantee, but I want to give this candle work all my focus.